Download "33 BUSINESS ACCOUNTING STANDARD FINANCIAL STATEMENTS OF FINANCIAL BROKERAGE FIRMS AND MANAGEMENT COMPANIES I. GENERAL PROVISIONS"
1 APPROVED by Order No. VAS-6 of 12 May 2006 of the Director of the Public Establishment the Institute of Accounting of the Republic of Lithuania 33 BUSINESS ACCOUNTING STANDARD FINANCIAL STATEMENTS OF FINANCIAL BROKERAGE FIRMS AND MANAGEMENT COMPANIES Version effective as from 26 November 2006 ( Valstybės žinios (Official Gazette), 2006, No. 2-38; No ). I. GENERAL PROVISIONS 1. The purpose of this Standard is to establish the procedure for preparing financial statements of the financial brokerage firms and management companies (hereinafter entities). 2. This Standard sets forth the general requirements for the composition and contents of the financial statements of the entities. 3. Recognition and measurement of business operations and events shall be carried out in observance of respective Business Accounting Standards. 4. Other financial entities may also apply the provisions of this Standard if they facilitate the accurate disclosure of the information about the financial standing, operating results and cash flows of such entities. II. 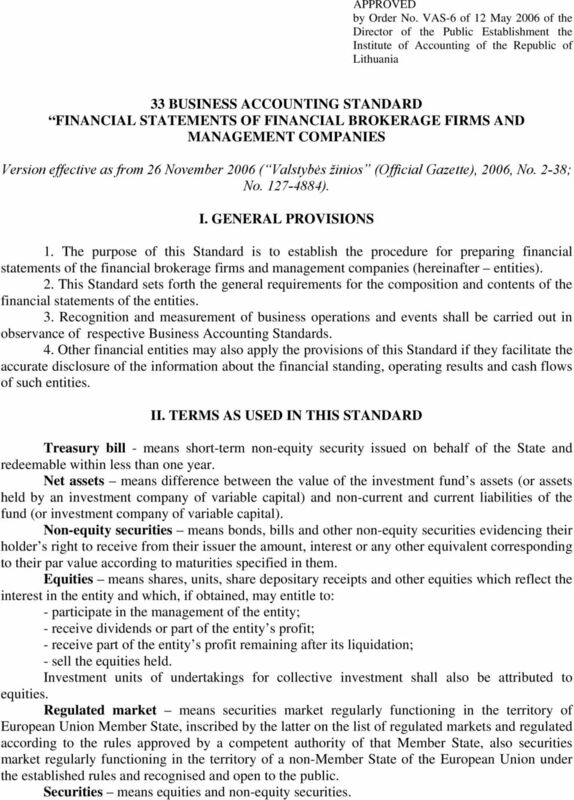 TERMS AS USED IN THIS STANDARD Treasury bill - means short-term non-equity security issued on behalf of the State and redeemable within less than one year. Net assets means difference between the value of the investment fund s assets (or assets held by an investment company of variable capital) and non-current and current liabilities of the fund (or investment company of variable capital). Non-equity securities means bonds, bills and other non-equity securities evidencing their holder s right to receive from their issuer the amount, interest or any other equivalent corresponding to their par value according to maturities specified in them. Equities means shares, units, share depositary receipts and other equities which reflect the interest in the entity and which, if obtained, may entitle to: - participate in the management of the entity; - receive dividends or part of the entity s profit; - receive part of the entity s profit remaining after its liquidation; - sell the equities held. Investment units of undertakings for collective investment shall also be attributed to equities. Regulated market means securities market regularly functioning in the territory of European Union Member State, inscribed by the latter on the list of regulated markets and regulated according to the rules approved by a competent authority of that Member State, also securities market regularly functioning in the territory of a non-member State of the European Union under the established rules and recognised and open to the public. Securities means equities and non-equity securities. 2 2 III. 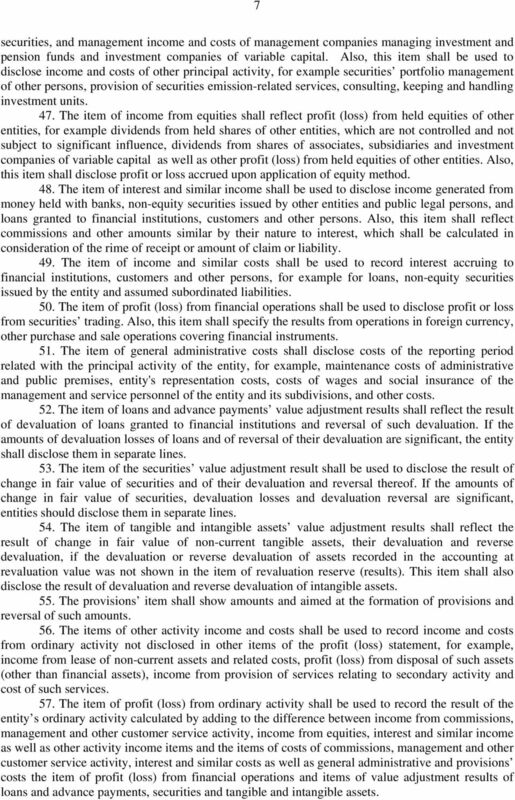 PRINCIPAL REQUIREMENTS FOR THE FINANCIAL STATEMENTS 5. When drawing up their financial statements the entities shall observe the present Standard and the provisions of the Business Accounting Standard 1 to the extent they are in compliance with the provisions of this Standard. 6. When drawing up their financial statements the entities shall observe the present Standard and the provisions of the Business Accounting Standard 29 Interim financial reporting to the extent they are in compliance with the provisions of this Standard. 7. Financial statements of the entities shall comprise: 7.1. balance-sheet and off-balance sheet report; 7.2. profit (loss) statement; 7.3. cash flow statement; 7.4. statement of changes in equity; 7.5. explanatory notes. 8. 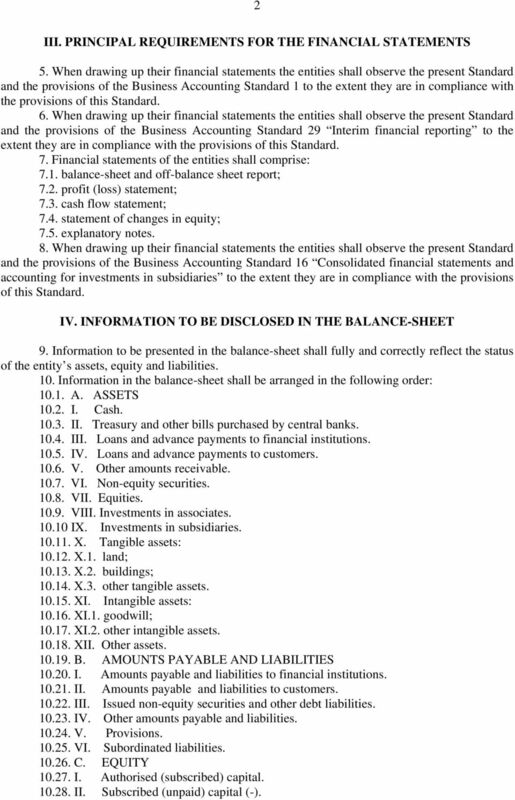 When drawing up their financial statements the entities shall observe the present Standard and the provisions of the Business Accounting Standard 16 Consolidated financial statements and accounting for investments in subsidiaries to the extent they are in compliance with the provisions of this Standard. IV. 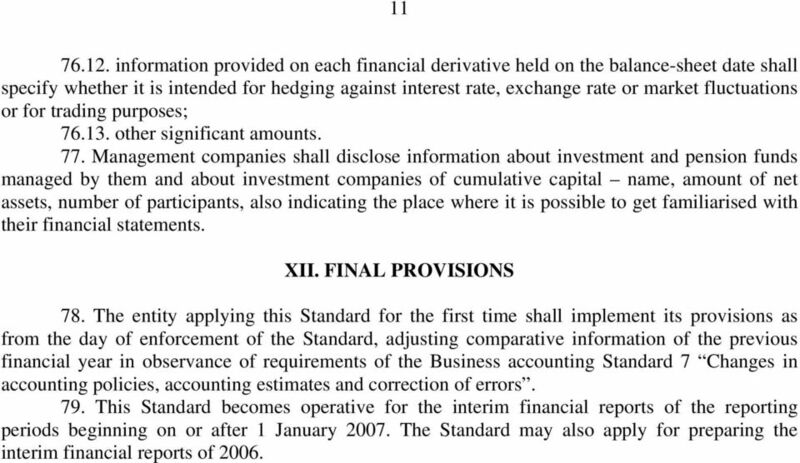 INFORMATION TO BE DISCLOSED IN THE BALANCE-SHEET 9. Information to be presented in the balance-sheet shall fully and correctly reflect the status of the entity s assets, equity and liabilities. 10. Information in the balance-sheet shall be arranged in the following order: A. ASSETS I. Cash II. Treasury and other bills purchased by central banks III. Loans and advance payments to financial institutions IV. Loans and advance payments to customers V. Other amounts receivable VI. Non-equity securities VII. Equities VIII. Investments in associates IX. Investments in subsidiaries X. Tangible assets: X.1. land; X.2. buildings; X.3. other tangible assets XI. Intangible assets: XI.1. goodwill; XI.2. other intangible assets XII. Other assets B. AMOUNTS PAYABLE AND LIABILITIES I. Amounts payable and liabilities to financial institutions II. Amounts payable and liabilities to customers III. Issued non-equity securities and other debt liabilities IV. Other amounts payable and liabilities V. Provisions VI. Subordinated liabilities C. EQUITY I. Authorised (subscribed) capital II. Subscribed (unpaid) capital (-). 3 III. Share premium IV. Own shares (-) V. Reserves VI. Revaluation reserve (results) VII. Retained profit (loss): VII.1. profit (loss) of the previous year: VII.2. profit (loss) of the current year: 11. Items referred to in point 10 of the Standard shall be mandatory, i.e. they shall also be included in cases of zero amounts. Items specified in the sample form of the balance-sheet may also be supplemented by items, other than those indicated in the sample form of the statement. Interim items specified in the sample form of the balance-sheet may be omitted if their balances are zero. Mandatory items should be disclosed in detail specifying material amounts in separate lines. 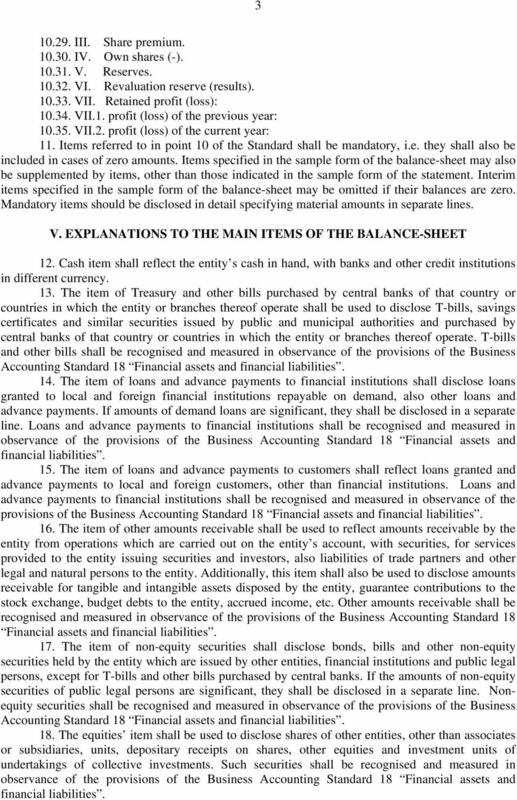 V. EXPLANATIONS TO THE MAIN ITEMS OF THE BALANCE-SHEET 12. Cash item shall reflect the entity s cash in hand, with banks and other credit institutions in different currency. 13. The item of Treasury and other bills purchased by central banks of that country or countries in which the entity or branches thereof operate shall be used to disclose T-bills, savings certificates and similar securities issued by public and municipal authorities and purchased by central banks of that country or countries in which the entity or branches thereof operate. T-bills and other bills shall be recognised and measured in observance of the provisions of the Business Accounting Standard 18 Financial assets and financial liabilities. 14. The item of loans and advance payments to financial institutions shall disclose loans granted to local and foreign financial institutions repayable on demand, also other loans and advance payments. If amounts of demand loans are significant, they shall be disclosed in a separate line. Loans and advance payments to financial institutions shall be recognised and measured in observance of the provisions of the Business Accounting Standard 18 Financial assets and financial liabilities. 15. The item of loans and advance payments to customers shall reflect loans granted and advance payments to local and foreign customers, other than financial institutions. Loans and advance payments to financial institutions shall be recognised and measured in observance of the provisions of the Business Accounting Standard 18 Financial assets and financial liabilities. 16. The item of other amounts receivable shall be used to reflect amounts receivable by the entity from operations which are carried out on the entity s account, with securities, for services provided to the entity issuing securities and investors, also liabilities of trade partners and other legal and natural persons to the entity. Additionally, this item shall also be used to disclose amounts receivable for tangible and intangible assets disposed by the entity, guarantee contributions to the stock exchange, budget debts to the entity, accrued income, etc. Other amounts receivable shall be recognised and measured in observance of the provisions of the Business Accounting Standard 18 Financial assets and financial liabilities. 17. The item of non-equity securities shall disclose bonds, bills and other non-equity securities held by the entity which are issued by other entities, financial institutions and public legal persons, except for T-bills and other bills purchased by central banks. If the amounts of non-equity securities of public legal persons are significant, they shall be disclosed in a separate line. Nonequity securities shall be recognised and measured in observance of the provisions of the Business Accounting Standard 18 Financial assets and financial liabilities. 18. The equities item shall be used to disclose shares of other entities, other than associates or subsidiaries, units, depositary receipts on shares, other equities and investment units of undertakings of collective investments. Such securities shall be recognised and measured in observance of the provisions of the Business Accounting Standard 18 Financial assets and financial liabilities. 4 4 19. The item of investments in associates shall reflect the total sum of investments in other entities over which the entity (investor) has significant influence, when such entities are not subsidiaries of that entity and not entities controlled under joint activity (partnership) agreement or joint venture. If the amounts of investments in associates, which are financial institutions, are significant, they shall be disclosed in a separate line. Investments in associates shall be recognised and measured in observance of the provisions of the Business Accounting Standard 15 Investments in associates. Available-for-sale investments shall be recognised and measured in observance of the provisions of the Business Accounting Standard 18 Financial assets and financial liabilities. 20. The item of investments in subsidiaries shall be used to show the amount of investments in other entities which are controlled by the entity. If the amounts of investments in subsidiaries, which are financial institutions, are significant, they shall be disclosed in a separate line. Such investments shall be recognised and measured in observance of the provisions of the Business Accounting Standard 16 Consolidated financial statements and accounting for investments in subsidiaries. Available-for-sale investments in subsidiaries shall be recognised and measured in observance of the provisions of the Business Accounting Standard 18 Financial assets and financial liabilities. 21. The tangible assets item shall reflect the full amount of tangible assets held by the entity, separately distinguishing land, buildings and other tangible assets. Other tangible assets include vehicles, plant and equipment, devices, facilities, investing assets, etc. Also, this item shall reflect inventories held by the entity. Tangible assets shall be recognised and measured in observance of the provisions of the Business Accounting Standard 12 Non-current tangible assets and Business Accounting Standard 9 Inventories. 22. The intangible assets item shall reflect total amount of intangible assets held by the entity, separately distinguishing between the amounts of goodwill and other intangible assets. Other intangible assets include development works, licenses, software, etc. Intangible assets shall be recognised and measured in observance of the provisions of the Business Accounting Standard 13 Intangible assets. 23. The item of other assets shall be used to disclose the amount of assets, not included in other asset items, for example profit tax paid in advance, profit tax overpayments of the current reporting period or previous reporting periods, deferred tax assets, deferred costs, etc. 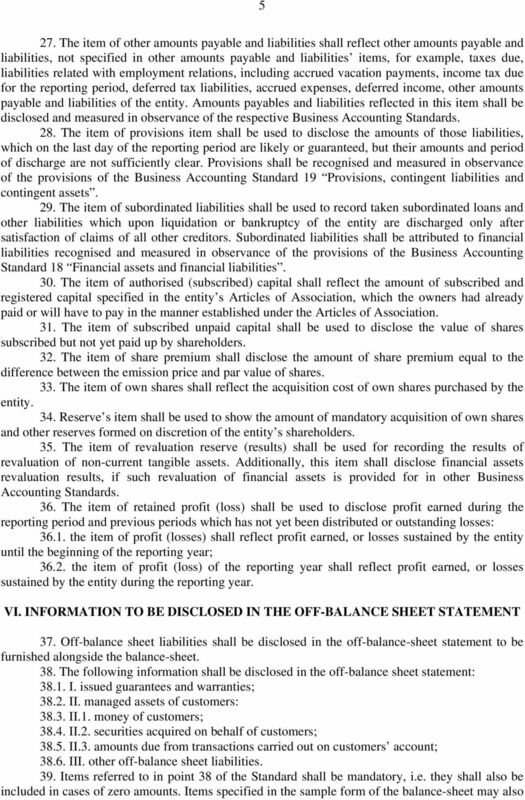 Assets reflected in this item shall be disclosed and measured in observance of the respective Business Accounting Standards. 24. The item of amounts payable and liabilities to financial institutions shall reflect the total amount of the entity s liabilities to local and foreign banks and other financial institutions. If the amounts payable on demand and amounts with fixed repayment term or notice periods are significant, they shall be disclosed in a separate line. Amounts payable and liabilities to financial institutions shall be recognised and measured in observance of the provisions of the Business Accounting Standard 18 Financial assets and financial liabilities. 25. The item of amounts payable and liabilities to customers shall reflect the total amount of the entity s liabilities to local and foreign customers, other than financial institutions. If amounts payable on demand and amounts with fixed repayment term or notice periods are significant, they shall be disclosed in a separate line. Amounts payable and liabilities to customers shall be recognised and measured in observance of the provisions of the Business Accounting Standard 18 Financial assets and financial liabilities. 26. The item of issued non-equity securities and other debt liabilities shall reflect bonds, bills and other non-equity securities issued by the entity as well as other assumed debt liabilities evidenced by respective debt certificates. Also, this item shall be used to disclose accrued interest and similar income from non-equity securities issued by the entity. 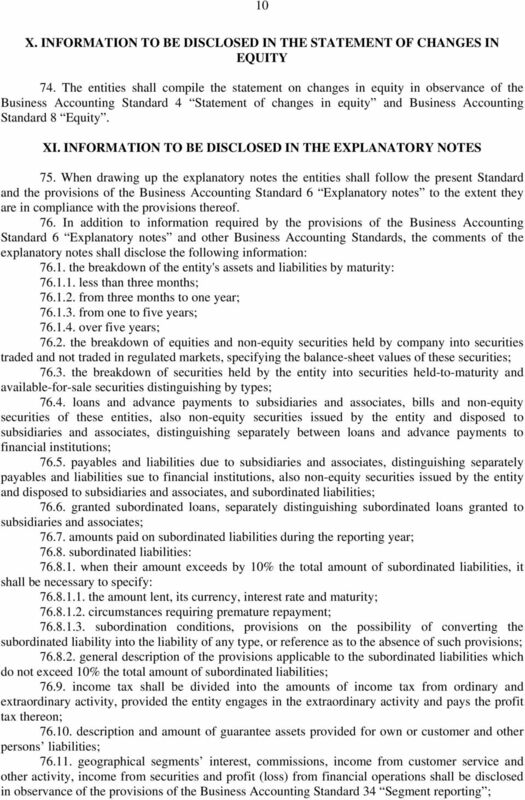 If the amount of non-equity securities issued by the entity is significant, it shall be disclosed in a separate line. Non-equity securities and other debt liabilities shall be recognised and measured in observance of the provisions of the Business Accounting Standard 18 Financial assets and financial liabilities. 7 7 securities, and management income and costs of management companies managing investment and pension funds and investment companies of variable capital. Also, this item shall be used to disclose income and costs of other principal activity, for example securities portfolio management of other persons, provision of securities emission-related services, consulting, keeping and handling investment units. 47. The item of income from equities shall reflect profit (loss) from held equities of other entities, for example dividends from held shares of other entities, which are not controlled and not subject to significant influence, dividends from shares of associates, subsidiaries and investment companies of variable capital as well as other profit (loss) from held equities of other entities. Also, this item shall disclose profit or loss accrued upon application of equity method. 48. The item of interest and similar income shall be used to disclose income generated from money held with banks, non-equity securities issued by other entities and public legal persons, and loans granted to financial institutions, customers and other persons. Also, this item shall reflect commissions and other amounts similar by their nature to interest, which shall be calculated in consideration of the rime of receipt or amount of claim or liability. 49. The item of income and similar costs shall be used to record interest accruing to financial institutions, customers and other persons, for example for loans, non-equity securities issued by the entity and assumed subordinated liabilities. 50. 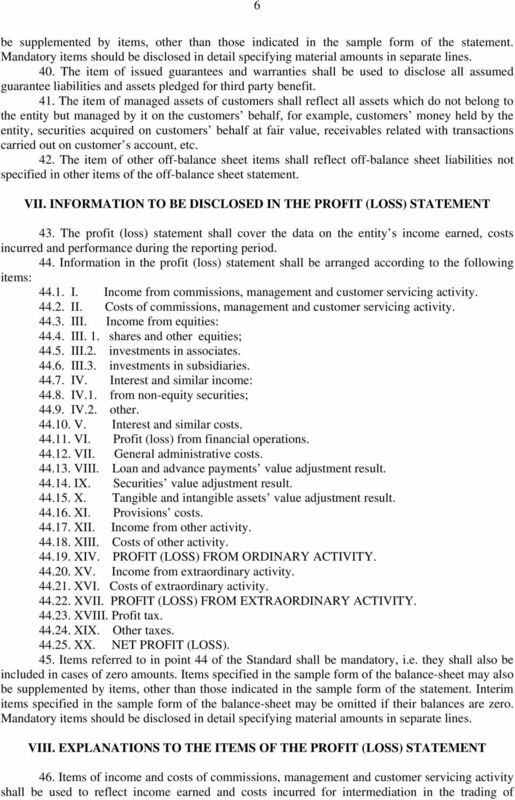 The item of profit (loss) from financial operations shall be used to disclose profit or loss from securities trading. Also, this item shall specify the results from operations in foreign currency, other purchase and sale operations covering financial instruments. 51. The item of general administrative costs shall disclose costs of the reporting period related with the principal activity of the entity, for example, maintenance costs of administrative and public premises, entity's representation costs, costs of wages and social insurance of the management and service personnel of the entity and its subdivisions, and other costs. 52. The item of loans and advance payments value adjustment results shall reflect the result of devaluation of loans granted to financial institutions and reversal of such devaluation. If the amounts of devaluation losses of loans and of reversal of their devaluation are significant, the entity shall disclose them in separate lines. 53. The item of the securities value adjustment result shall be used to disclose the result of change in fair value of securities and of their devaluation and reversal thereof. If the amounts of change in fair value of securities, devaluation losses and devaluation reversal are significant, entities should disclose them in separate lines. 54. The item of tangible and intangible assets value adjustment results shall reflect the result of change in fair value of non-current tangible assets, their devaluation and reverse devaluation, if the devaluation or reverse devaluation of assets recorded in the accounting at revaluation value was not shown in the item of revaluation reserve (results). This item shall also disclose the result of devaluation and reverse devaluation of intangible assets. 55. The provisions item shall show amounts and aimed at the formation of provisions and reversal of such amounts. 56. The items of other activity income and costs shall be used to record income and costs from ordinary activity not disclosed in other items of the profit (loss) statement, for example, income from lease of non-current assets and related costs, profit (loss) from disposal of such assets (other than financial assets), income from provision of services relating to secondary activity and cost of such services. 57. The item of profit (loss) from ordinary activity shall be used to record the result of the entity s ordinary activity calculated by adding to the difference between income from commissions, management and other customer service activity, income from equities, interest and similar income as well as other activity income items and the items of costs of commissions, management and other customer service activity, interest and similar costs as well as general administrative and provisions costs the item of profit (loss) from financial operations and items of value adjustment results of loans and advance payments, securities and tangible and intangible assets. 9 dividends paid (if these payments according to the accounting policy are attributed to the principal activity); interest received (if these receipts according to the accounting policy are attributed to the principal activity); interest paid (if these payments according to the accounting policy are attributed to the principal activity); monetary payments to employees; paid taxes; other monetary receipts from the principal activity; other monetary payments from the principal activity; 70. Cash flows of the investing activity shall reflect monetary amounts spent during the reporting period on acquisition assets which will not generate economic benefits during the longterm period and receipts from disposal of such assets. 71. 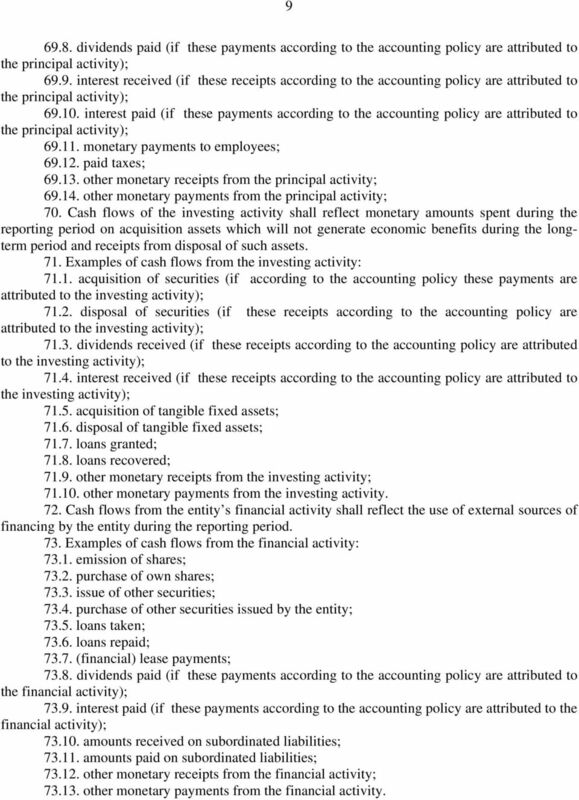 Examples of cash flows from the investing activity: acquisition of securities (if according to the accounting policy these payments are attributed to the investing activity); disposal of securities (if these receipts according to the accounting policy are attributed to the investing activity); dividends received (if these receipts according to the accounting policy are attributed to the investing activity); interest received (if these receipts according to the accounting policy are attributed to the investing activity); acquisition of tangible fixed assets; disposal of tangible fixed assets; loans granted; loans recovered; other monetary receipts from the investing activity; other monetary payments from the investing activity. 72. Cash flows from the entity s financial activity shall reflect the use of external sources of financing by the entity during the reporting period. 73. 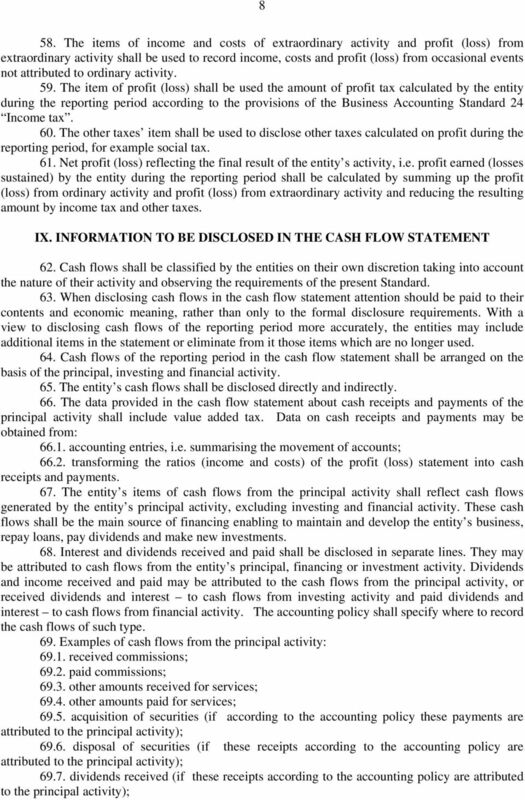 Examples of cash flows from the financial activity: emission of shares; purchase of own shares; issue of other securities; purchase of other securities issued by the entity; loans taken; loans repaid; (financial) lease payments; dividends paid (if these payments according to the accounting policy are attributed to the financial activity); interest paid (if these payments according to the accounting policy are attributed to the financial activity); amounts received on subordinated liabilities; amounts paid on subordinated liabilities; other monetary receipts from the financial activity; other monetary payments from the financial activity. 11 information provided on each financial derivative held on the balance-sheet date shall specify whether it is intended for hedging against interest rate, exchange rate or market fluctuations or for trading purposes; other significant amounts. 77. Management companies shall disclose information about investment and pension funds managed by them and about investment companies of cumulative capital name, amount of net assets, number of participants, also indicating the place where it is possible to get familiarised with their financial statements. XII. FINAL PROVISIONS 78. 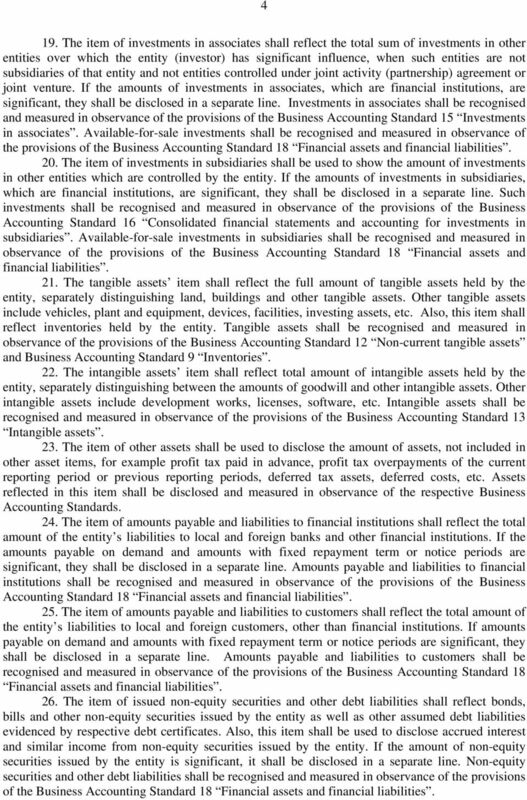 The entity applying this Standard for the first time shall implement its provisions as from the day of enforcement of the Standard, adjusting comparative information of the previous financial year in observance of requirements of the Business accounting Standard 7 Changes in accounting policies, accounting estimates and correction of errors. 79. This Standard becomes operative for the interim financial reports of the reporting periods beginning on or after 1 January The Standard may also apply for preparing the interim financial reports of 2006. NAME OF FORM: BALANCE SHEET AND CLIENT ASSETS SEC-MMRF01. Unless otherwise stated all amounts are to be expressed in TTD. This version includes amendments resulting from IFRSs issued up to 31 December 2010. Indian Accounting Standard (Ind AS) 21 The Effects of Changes in Foreign Exchange Rates (This Indian Accounting Standard includes paragraphs set in bold type and plain type, which have equal authority.